I wanted to reflect nature in a black-grey-white monochrome. 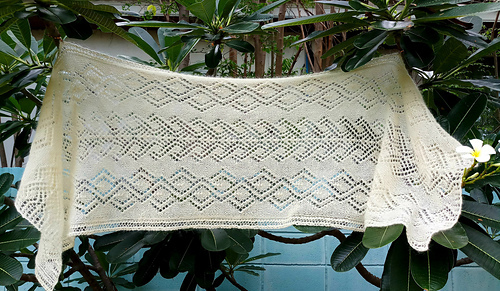 This rectangular wrap incorporates leaf and wing geometric lace patterns and lets the yarn colorway create tonal shading and shadows throughout. 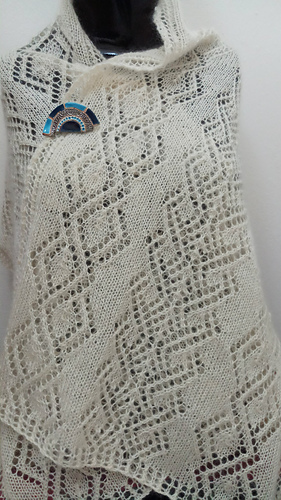 The lace stitch patterns are relatively easy to knit and the length of the shawl can easily be adjusted by increasing or decreasing the number of pattern repeats. The instructions are written out, and easy to follow. When I was visiting Ireland I bought some natural kid mohair from Northern Ireland and wanted to use it with this pattern. I followed the pattern as written, but changed to US5/3.75mm needles and used a bit more than 1-1/2 skeins of pure kid mohair (in Natural) from Breezemount Farm (about 550-575 meters total).